My love affair with toast hasn’t waned since it began back in May. Sure, there’ve been some breadless mornings where I eat a piece of fruit or don’t eat anything at all, but most mornings there I am in my kitchen, slicing a big slice of bread, popping it into my cheap-o toaster and slathering it with something interesting. The slathering, as you might imagine, is the most exciting part. That’s why I keep my eyes peeled wherever I go for potential toast toppings. 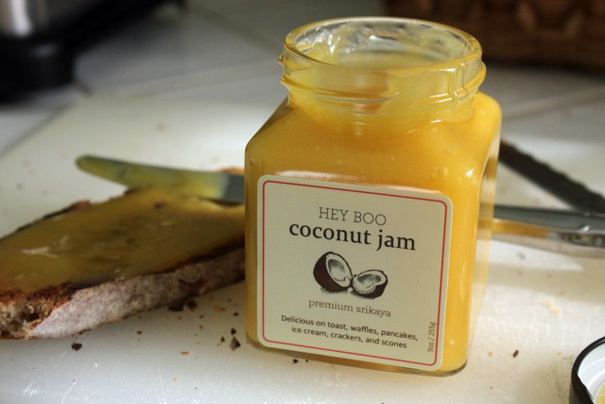 My favorite, so far, is the one you see in the picture above: Hey Boo Coconut Jam. I found it, as I did these other toast toppings, at Cookbook in Echo Park. If you saw Susan Feniger on “Top Chef Masters” or you’ve eaten at her restaurant Street, you’re probably familiar with her Kaya Toast. That’s one of the dishes she taught me how to make when I cooked with her for SECRETS (arriving in 6 weeks!). The coconut jam we made together, a combination of coconut milk infused with pandan and sugar, took a long time over the stove (which I didn’t mind at all, since it meant we could chat for a while). That jam’s then spread on toasted white bread with salted butter and dipped into a soy-sauce drenched egg. It’s pretty divine. Hey Boo jam might allow you to have a similar experience without all that work. Or you could do as I do and simply spread it on toast in the morning. It’s a bright blast of sunshine in your mouth, transporting you, for one precious moment, to a beach sipping a pina colada while reading trashy magazines looking at the ocean. Most jams have a wintery feel, this one is full-on summer. I highly recommend it. 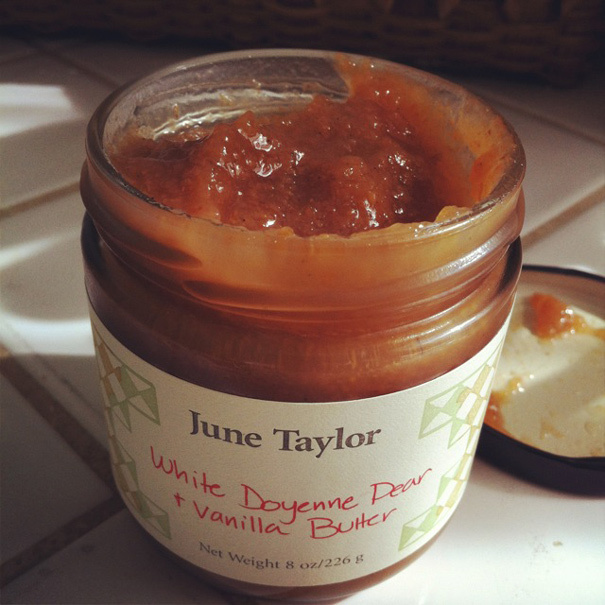 In San Francisco, if you say “jam,” you’ll immediately hear the name June Taylor. If the coconut jam is a loud steel drum band playing on a pier, this stuff is like a quiet violin concerto played in a park. It’s subtle. Maybe too subtle for toast. The texture’s certainly wrong for toast, like apple sauce, which would be weird to eat on hard bread. So this jar doesn’t get much play in my kitchen, but I do think it might work nicely on some kind of dessert or maybe, even, as a topping for pork chops. 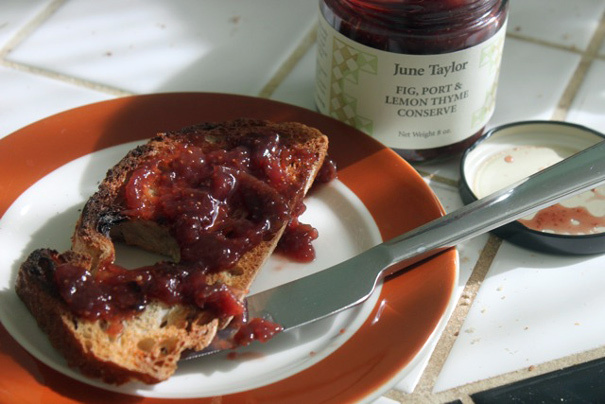 My other June Taylor purchase has fared much better in the mornings; that’s her Fig, Port, Lemon Thyme Conserve. Again, there’s something quiet about June Taylor’s products that forces you to pay closer attention than you would if they’d been laced with mountains of sugar. This stuff is certainly bolder than the Pear Butter, but still not quite as bold as traditional store-bought jam. I’m thinking it might work better as a topping for chicken liver pâté or with cheese. And that’s what I’ve been putting on my toast lately.